A couple of years ago, I was teaching a group of high school freshmen about copyright. In my library at the time, student art work filled many of the open spaces and shelves. I asked the art teacher to always label every piece with the student-artist’s name, as the kids certainly deserve the credit for all the hard work they put into the piece. In the middle of my lesson, I turned around and pretended to notice the beautiful ceramic piece behind me for the first time. Commenting and complimenting the artwork, I then removed the student name placard and replaced it with one of my own. One with my name on it. ”You like this piece of artwork I did last night?” I asked the students. What I was doing, during my little stunt, was attempting to pass off another’s work as my own: the very essence of copyright infringement. What worries me as a teacher, librarian, and a parent, is that students so often miss this point. They don’t see that using someone else’s stuff in their own stuff is a violation of copyright. It is, essentially, unethical behavior. When they do a Google search for an image, right-click on the image to copy it, and paste it into their own project, they’re really doing the same thing that I used to do in middle school when I would copy, word-for-word, chunks of text out of an encyclopedia and into a school report. Yet, when you call students on this behavior, and point out that what they’re doing is, in effect, stealing from the original creator of the image or video or song or whatever, they look at you like you’re some ancient relic. One misconception about copyright: if it doesn’t have the copyright or trademark symbol next to it, it must be okay to use. Not so. Under the U.S. copyright law (Title 17 of the U.S. Code), copyright/ownership is established as soon as the work is created. I click publish, the essay belongs to me. My finger pushes the shutter on my camera, the photo belongs to me. I record a song or piece of music, it belongs to me. Yes, artists and creators can still officially file for copyright, but this is largely unnecessary anymore, except in certain cases. One thing I always try to stress with students is that this law is to protect them as creators. It is not just a move to limit their ability to grab photos and images for their next PowerPoint presentation. I’m pretty sure the student artist whose beautiful ceramic piece I “stole” would agree. As with many laws, there are exceptions. The Fair Use exception (Section 107 of the Copyright Act) allows for the use of copyrighted materials under certain circumstances, including literary criticism, reporting, teaching, scholarship, and research. While Fair Use is rather complex (as most legal language is! ), it doesn’t need to be confusing. As parents of digital kids, the only use of the exception we really need to understand is the academic one. Simply put, why are you using the material? Are you trying to make money off it? Then, sorry. Is this for a school setting? Probably okay. In general, the more creative the work (a song, poem, short fiction, graphic, unique photograph, movie clip, etc.) the more likely you will be violating copyright and Fair Use can’t be ‘claimed.’ On the other hand, using a more factual work (a news article, a technical report, etc. ), would fall more easily under Fair Use. Basically this has to do with two things: how much of the work are you using, and how significant is this ‘part’ to the whole thing. For example, using an entire song as the soundtrack to my presentation would not hold up under Fair Use, but using a 30-second clip would. Another common example. For projects, kids love using sports logos, all of which are copyrighted. Here in Wisconsin, if I used the well-recognized Green Bay Packer “G” logo, but just altered the colors, I’m still using the most significant part of the original work: the iconic letter in that particular shape and orientation. Making it pink doesn’t give me the right to use it. Ok, this has to do with money and how much might be lost if I use the copyrighted work in my own thing. If I’m taking a chunk of the work and selling it or giving it away, and that may impact the sales for the original owner, that’s not Fair Use. Really, the best example of this actually relates to the adults. If a teacher makes 30 copies of a classic poem for use in her English class, clearly Fair Use. If that same teacher takes a workbook (the kind that you are supposed to buy for each student every year) and makes 30 copies of some of the activities for class, that’s not meeting this 4th criteria of Fair Use. Potentially, it has a “market” impact on sales of that workbook. It would mean this school in particular would not be buying 30 copies of the workbook each year. Funny, publishers don’t like that. Go figure. So, if the Fair Use exception says that students can use copyrighted material, why limit them? Why teach them to find other sources when Google Image Search is the easiest way? Does it really matter? I mean, the law itself explicitly states the exceptions to itself! My fear, as a teacher, is that we will train kids so well on what the exception to the law is that when they are no longer “covered” in an academic setting, they will use stuff that they shouldn’t be using in places where they shouldn’t be using it. 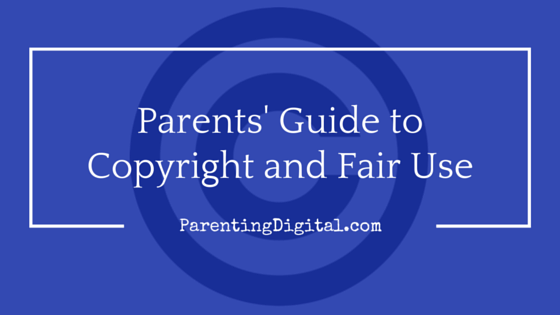 Even though kids can use copyrighted material, providing they meet the Fair Use criteria, why not encourage them to use copyright-free images, video, audio, etc., now. Within a Google Image search, you can filter only those photos and graphics where the creator has given permission for the image to be used. To do this, start with the search itself, just as you normally would. Once the results come up, click on Search Tools, then Usage Rights. Select “Labeled for Reuse”, and the filter will re-sort the results. With just a little more effort, kids can find the images they need in one of the many copyright-free collections online. The amount of royalty-free content is growing every day. For example, the New York Public Library just recently release over half a million digital images for public use. Creative Commons was developed as an easy way for creators to “give permission” for their works to be used, and to specify what they will and won’t allow. Artists, photographers, writers, and others can “stamp” their works with different licenses. Some search tools will let you filter by Creative Commons license, and you can look for the symbol as well. Of course, the best way to avoid breaking copyright or accidentally using someone else’s work is to produce your own. Take your own pictures for backgrounds in a PowerPoint slide. Create your own music soundtrack using GarageBand or another online music creation tool. While our children may be getting some of this in school, this ethical use of other people’s intellectual property needs to be reinforced at home, too. First, we must set good examples as parents. And, yes, this includes what we are sharing on social media. Or the Disney character we were going to use in the poster we are making for the PTA. Start early talking about the connection between respecting the physical property of others and the digital property of others. This isn’t something we have to wait until middle or high school to start teaching. Finally, encourage them to cite sources: giving credit when they use someone else’s stuff. No, teachers will not always require this on a project or assignment. And yes, this will eventually look like all that MLA/APA stuff that you suffered through in school. But it sends a clear message that, if it’s not yours, be very careful how you use it.